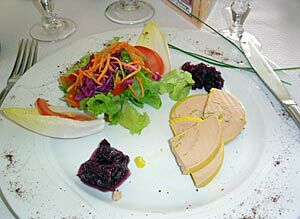 French cuisine is characterized by its extreme diversity. In that, it can only be compared to Chinese cuisine or the cuisine of India. Cuisine from the southeast, Provençal, favors olive oil, herbs, and tomatoes. famous for its delicate dishes of fresh water fish and Loire Valley white wines, the Basque cuisine famous for its use of tomatoes and chili, or the cuisine of Roussillon akin to Catalonian cuisine. With the movements of population of contemporary life, such regional differences are less noticeable than they used to be, but they are still clearly marked, and one traveling across France will notice significant changes in the ways of cooking and the dishes served. Moreover, recent focus of French consumers on local, countryside food products (produits du terroir) means that the regional cuisines are experiencing a strong revival in the early 21st century. What is known outside of France as “French cuisine” is the elaborated cuisine of the higher classes of Paris, served in restaurants for hefty prices. This cuisine is mostly influenced by the regional cuisines of northern France, with a marked touch of refinement. It should be noted, however, that average French people do not eat or prepare this cuisine in their everyday life, and rather eat the regional cuisine of the region where they are located (or the region where they grew up). French wine and French cheese are an integral part of French cuisine (both Paris high cuisine and regional cuisines), both as ingredients and accompaniments. France is known for its large ranges of wines and cheeses. Travellers who seek in restaurant of local reputation more ‘characteristic’ meals than are offered by the ordinary tourist hotel are at first inclined to suspect that the dishes peculiar to Southern France are little more than compounds of olive oil and garlic. As a matter of fact it is the complete understanding of the use of these ingredients, aided by the subtle atmosphere of the South, that raises southern cookery to the rank of a fine art. The people of Bordeaux and Gascony have the reputation of hearty eaters, and the local dishes have a character accordingly. Among the many egg dishes omelettes au piment, flavoured with mild pimentoes of a soft metallic taste, are characteristic, as are also gâteaux de mais, maize-cakes in the Italian style. Birds are much appreciated, from the petits oiseaux stewed in thick black gravy or roasted on a skewer, to the notable turkeys of Gascony. Dinde aux marrons, turkey stuffed with whole chestnuts, is equal to the best product of Norfolk. Larks are killed during a few weeks in September and are roasted in vine leaves; wood-pigeons (palombes) are served en casserole; and the wild duck of the lagoons are justly famous. Most famous, of all, however, is the confit d’oie, a conserve of goose, made in the autumn. For this the fattened geese, drained of blood, are flavoured with salt and garlic, and slowly cooked in an earthenware jar; when ready they are covered with fat and potted. The liver is treated separately, either made into pâte de foie gras with truffles, or perhaps stewed in wine. Cèpes à la Bordelaise and fungi, such as are found in the cork-oak woods, dried and fried in oil. They may be seen hanging to dry in garlands in the village kitchens. The oysters of Arcachon and Hosségor are nearly equal to those of Maxenneg, and the matelote de lamproie is a rich stew of the lampreys whose lusciousness helps to explain the legendary fate of Henry I. Pauilliac lamb rivals Southdown mutton in flavour. The staple dish here is garbure, cabbage soup blended with warm Béarnais pimento, haricot beans, potatoes, and a portion of confit d’oie, so stiffly mixed that a spoon can stand upright, in it. Piperrade is made of tomatoes fried in goose or pork fat with onions And pimentoes and served with eggs fried in oil. 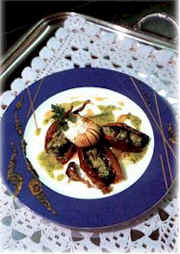 Famous for tomatoes and snails, the latter called escargots de vigne or petits gris. The cassoulet of Castelnaudary is a substantial stew of mutton, pickled pork, sausages, and possibly confit d’oie, flavoured with garlic and garnished with haricot beans. Roquefort cheese is the. most famous in the south; it should be moist in appearance. In the ROUERGUE the peasant’s soup is oulade a dish of vegetables and bacon named from the ‘ oule ‘ or copper pan in which it is cooked. Mourtayrol, made in a ‘ mortier,” is an Easter delicacy, made of beef, chicken, ham, and vegetables, to which are added bread, saffron, and water. The liquid and vegetables are served as soup, the rest forms a second course. Petites are small rolls of tripe stuffed with herbs and ham and stewed in earthenware jars with lambs’ feet. which are delicious when fried together. Boudin is a white pudding of pork flavoured with fennel and rum and served with fried russet apples. The sweets peculiar to Auvergne are acacia flowers dipped in batter flavoured with orange-water and fried, and milliard, a kind of batter of pudding containing black cherries. ‘ Cadet Mathieu ‘ is nothing more than apple pie. Farther West, in the LIMOUSIN, we may enjoy clafoutis, a baked custard filled with black cherries. is noted for its richness. Poulet Célestine, made with one of the famous chickens of. the Bresse, is a lightly fried chicken with a sauce of dry white wine and liqueur brandy; crayfish, oreilles de veau farcies, and quenelles are likewise famous at Lyons. The last is a rich dish of mashed fish, breadcrumbs, and butter, shaped into a roll and stewed in a pink sauce of cream and crayfish. Fondue de Belley is a glorified ‘Welsh rarebit’ with the addition of eggs and truffles. Valromey in Savoy is famous for its morilles a spongy fungus of delicate flavour, but almost impossible to clean of sand. is commonly regarded as most typical of the ‘Midi’ To be fully appreciated, the midday meal should be served in a darkened roorn and followed by a siesta. A typical meal might begin with saucisson d’Arles, black olives, or ‘pommes d’amour’ (i.e. tomatoes) as hors d’oeuvre. The ingredients of the soup aigo boulido are oil, garlic, herbs, pepper and salt, and yolk of egg. In Marseilles bouillabaisse would follow, but in Marseilles or its neighbourhood only (though Thackeray sings of bouillabaisse in Paris), for in the gulf are caught the rascasse, roucaou, and St-Pierre, the three fish which are essential to its success. The complete dish is a stew of hard and soft fish with onions, oil, garlic, saffron, and boiling water. The liquor is strained on to slices of bread and served separately. Vegetable dishes include various preparations of the aubergine (au naturel or farcie), and artichaut farci, moistened with oil and baked. Aïoli, a mayonnaise, served with a disproportionately small quantity of fish, is composed of vinegar, milk, breadcrumbs, and oil, blended with pulverized garlic. A mess of codfish called brandade is a favourite dish; poutargue, from Martigues, is a kind of caviare made of dried roe, oiled and pressed, tian, a dish of vegetables, eggs, and fish, flavoured with cheese and garlic, is highly esteemed at Carpentras. The goat’s-milk cheeses of St-Marcellin and Chabichou are too often like plaster, but when in perfect condition are delicious.